Obsessed with baking the perfect batch...every time? If you work hard to get your baked treats to deliver mouthwatering perfection, and you prefer to use chef quality kitchen tools, at a home-makers price, then you'll love the Bellemain. Yet every culinary master knows that the Secret to perfect treats isn't about how your baked goods "cool", it's about how they SET. BAKE WITH CONFIDENCE: With 40% more crosswire than its nearest competitor, the Bellemain cooling rack's narrow grid pattern ensures that even your most delicate baked goods does not sag, droop, or drop while also keeping proper air circulation underneath. EASY USE AND NO-SNAG CLEAN-UP: The Bellemain Cooling Rack is dishwasher- and oven-friendly-pop it from one right into the other with ease. And, unlike cheap knock-offs, our edges are authentic, with no sharpness to them that would snag and scratch cloths, skin, or scouring sponges like knock-off brands. USE WITH PRACTICALLY ANYTHING: Forged from sturdy 10-gauge iron and having six supporting feet means the Bellemain cooling rack holds more than your average rack-from the fluffiest of pastries to a 10lb pot of stew. 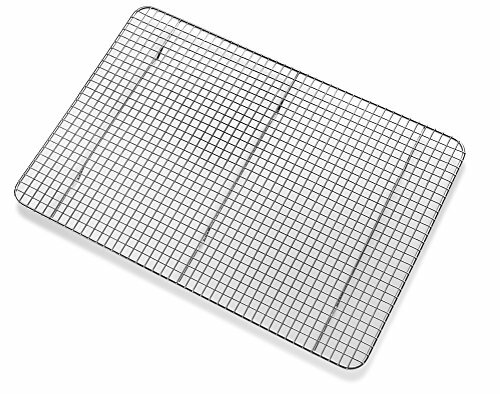 QUIT DEALING WITH CHEAP IMPORTS: You deserve a cooling rack that fits perfectly in your half-sheet pan (without jostling), stays flat, and takes the heat you give it-Bellemain uses only the best manufacturing products and process when producing our cooling racks, so you can use it with confidence. 10-YEAR "IT'S STILL PERFECT!" WARRANTY: Bellemain products are known to last...and last...and last. If at any point in the next ten years this Bellemain cooling rack bends, warps, or stops performing perfectly, return it for a full refund or replacement, no questions asked.